RCT Touch – Valentine’s Update! Better grab a breath mint… our Valentine Season has made its grand return! The romantic new park environment is guaranteed to make you SWOON, as you collect 31 dreamy Valentine cards including a new legendary building, the Lovebird Shop! 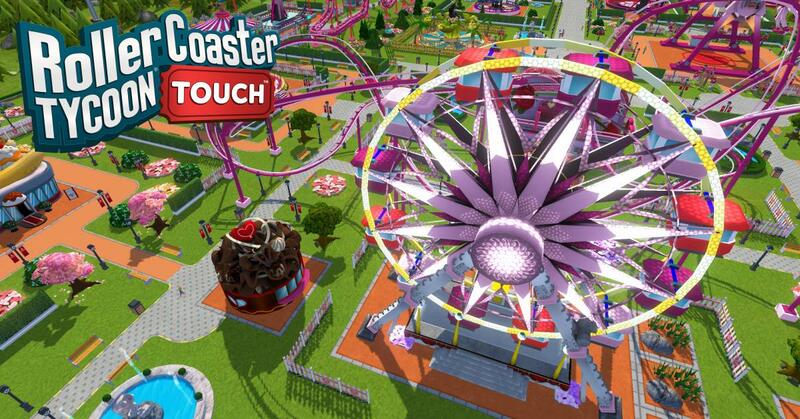 Read on for a full list of updates, and thanks for playing RollerCoaster Tycoon Touch! The Valentine Season is back! Discover a brand-new park environment and main hub straight from Cupid’s cutest dreams. Enjoy a lush new romantic musical score as you build your park. Collect 31 exclusive Valentine cards including 1 ride, 1 restaurant, 2 shops, 1 entertainer, 9 decorations, 3 colors and a special skin for all your coaster stations and trains. Collect every Valentine decoration before the end of the season to unlock the Valentine fence. Level up your Valentine cards to trigger additional revenue & peep boosts for your park! New legendary building: the Lovebird Shop, that increases the rate for double-hearts given by happy peep bubbles. New Scenario: UTILITARIANISM! You only have half a park, and must optimize the space to attract as many peeps as possible. Complete the new Scenario to win up to 3 new ride skins. New Languages: Korean and Japanese language support added. ©2018 RCTO Productions, LLC. All rights reserved.